We have added some cool new features and worked on simplifying our wizard. See our new features here. Your website is constantly susceptible to changes. Changes in plugins, scripts but also in cookies. 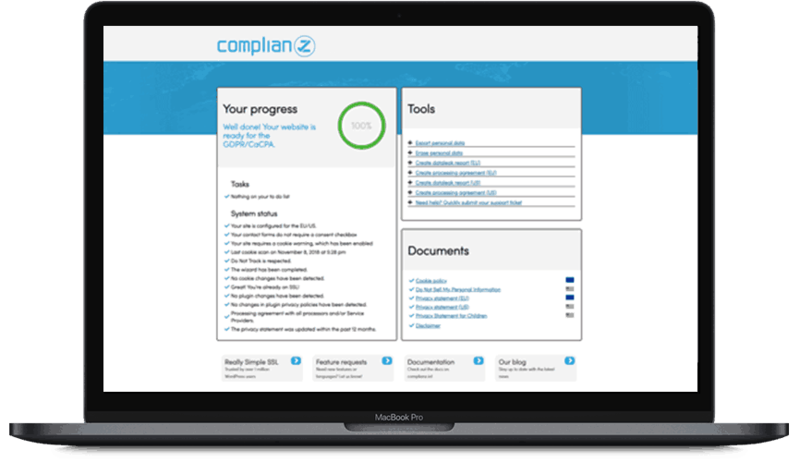 We scan your website and remind you when action is required to stay compliant. The free version comes with 1 language, based on your WordPress language settings. The premium version consists of 5 languages, English, Spanish, French, Italian, German & Dutch. Optimize your Cookie Notification by tracking conversions in the Complianz Dashboard. We made sure our plugin neatly integrates with the new WordPress Privacy Update and following 5.0 release. Use our dashboard to get access to all native WordPress features, quick and easy! Changes in GDPR and the upcoming E-Privacy laws could affect your current legal documents. New plugin updates are available when those changes are mandatory. We keep working on more languages & more features. Let us know if you are looking for a new language or feature! Don’t know where to start? Get to our features page or leave a message at complianz.io/contact, we are happy to help! Our support team is ready to assist you with any question before, during or after installation. We hope to provide you with the best possible plugin, but if there are any problems of any sort, please let us know! I really appreciated the wizard that helped to setup my cookies policy because was really overwhelming for me to handle the GDPR and I tried many plugins none felt novice friendly. I had a minor issue with the css and the support was really nice to help me out with it. I plan to buy pro version when I will be able to make some money out of my blog! Tried different GDPR plugins, but this one offers the most possibilities and is by far the easiest and most clear one I have used. Good job! I have tried a lot of different GDPR plugins, but this one absolutely offers the most possibilities and is by far the easiest and most clear one I have used. Great job! This is my favorite GDPR/Cookie plugin. Nice look. Functionality in the first place. Well done. I’m thrilled with support. Professionalism at every step. What to say except that if you are looking for a quality cookie plugin then you’ve found it. We will cover all steps from top to bottom, feel free to skip if most of the steps are clear. The steps can be done in random order. While developing Complianz Privacy Suite, some interesting questions arise. One of them I encountered today is: are Google Recaptcha and the GDPR reconcilable on your website? How to use our Script Center, available in our Free version! How to implement Tag Manager for your Cookie Banner needs. For help, please log a support ticket! We have seen with Google ReCaptcha that handling Google’s API for GDPR and other privacy laws is a tricky one, and for most not yet handled the right way. Complianz GDPR Cookie Consent will block content from third party services like Youtube, Facebook, Linkedin, etc, to prevent these services from placing tracking cookies. This article shows how to change the default placeholder. Get inspiration of just some of the possibilities of our Templates and Custom CSS! When you want to comply to the GDPR without having to show a cookie warning, you have to do some adjustments in your Analytics area. In this article we will explain you how to do this.